Oh I love a good smudging! It is truly one of the most universal practices in every culture and religion. 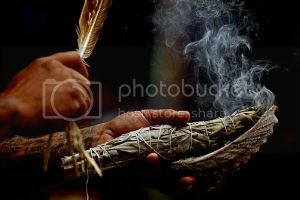 In essence smudging is the burning of herbs to cleanse and area or a person. Most commonly the herb used is sage, or white sage. But you can use a variety of other herbs that you feel are appropriate for the moment. You can use lavender, cedar even frankincense and myrrh can be ground and burned together. You can use a fan, a feather or even your hand to waft the smoke throughout the home or onto the person. Smudging is even used to help in the healing process, to help strengthen and purify our spirit so our bodies can restore quicker. What I personally use smudging for is to help center myself for when I am about to meditate, or go into a ritual. My preferred herb is white sage. Even the scent of someone else using sage I start to ground myself. Our sense of smell is one of the most powerful senses that we have. For example if you walk by a bakery and smell the delicious oatmeal cookies baking, it can pull on memory from your childhood of when you and grandma use to make the cookies together. To smudge before and even during a meditation or a past life regression will help you to focus your thoughts and energies on the task at hand. Smudging will help when at the end of a hard and stressful day to help you leave behind the days concerns so you can spend quality time with your loved ones. Or say you are about to go into a difficult test or an interview, you can smudge just before going to help you direct your energies to make your endeavor a success. However the most common form of smudging is to smudge one’s home. And the way one does this is to close all windows but open every internal door of the house. Leave open the front door (as long as there are not any little critters that would run out. Start at your front door and work clockwise through your home close each door after you have finished. Push all of the negative energies and spirits right out the front door! It is not a bad idea to do this once a month on a new moon, or before and after company comes to stay. Oh smudging, it is truly one of the best practices to make a habit!